These pages will contain reports and results of scale and steering events at Beale Park, both club and open events, together with articles of general interest to all ‘scale model boaters’. For clarity, at the MTMBC when we refer to ‘scale’ model boats we mean any model that isn’t a sailing yacht or ‘wind-powered’ model! During 2016 our formal scale boating continue with several rounds of scale steering competitions to be organised.. . 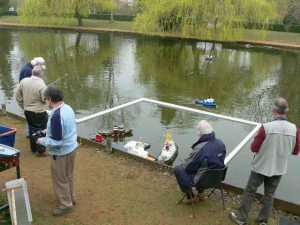 However, the many Sundays throughout the year are scheduled as a ‘Free boating session’, with ‘Themed’ activities so, why not bring one (or more) of your boats to the Sunday ‘Free boating sessions’ at Beale Park and enjoy some informal and interesting scale activities; and have a chance to meet up with fellow members for some model boating chat! When I returned to model boating as a forthcoming retirement hobby, I had a very biased view of “scale” boats. Mentally, I saw them as museum quality models, detailed to the last porthole, which looked too good to get their hulls wet except on the calmest, sunniest days. Nothing could have been further from the truth. Everything we build or buy is a scale model of some description. It looks like a boat – it floats – it moves. It may be a very basic model which has been knocked up by a doting grandparent over a couple of weekends in the garden shed. But it will give its young owner immense pleasure, and that will rub off onto Grandad. It may be a very highly detailed model warship, correct to the last rivet, which has taken five years to complete in a purpose built workshop, using complex machine tools and engineering skills. That will have given its builder great satisfaction during its construction. It may be plastic, look extremely realistic, and have come out a box ready to run except for needing a battery charge. It will rush about the lake like a demented banshee. But it will give its owner a lot of fun, even at the cost of some annoyed ducks! But isn’t all the above the essence of our hobby? Pleasure, fun, satisfaction! Once the initial excitement of being able to control our craft has worn off, we start to look for other challenges to take up with it. Within MTMBC, we run steering competitions, time trials, tug towing sessions, several classes of racing boats, sailing regattas. Sometimes we have the opportunity to compete with other clubs. It doesn’t matter what your boat is, bring it along and enjoy sailing it. Model boating is a hobby, Dictionary definition – “An activity that a person does regularly for pleasure.” So come along and get some pleasure from your pride and joy! The aim is to emulate real ship handling assisted with tugs within confined harbour spaces, in common with the real world a berth in a harbour is set up with buoyed channel markers to be navigated without collision.This has an international following with many national and international events. 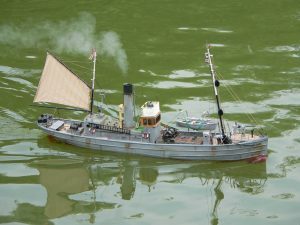 Model tug towing is normally conducted with a “Dead ship” eg. The towed vessels engine/s not employed thus all motion comes from the tugs applying force. Ships normally use their own power to move backwards and forwards along side a berth and the tugs provide the sideways and turning movements. It sounds easy but to be effective first learn to control your tug stopping, starting and turning in any direction with out delay, directional control ideally needs to become instinctive also be careful of the tow rope wrapping round your prop when turning alongside the towed ship. The dead ship takes time to start moving with the tugs and this inertia has to be taken into account when stopping/turning.